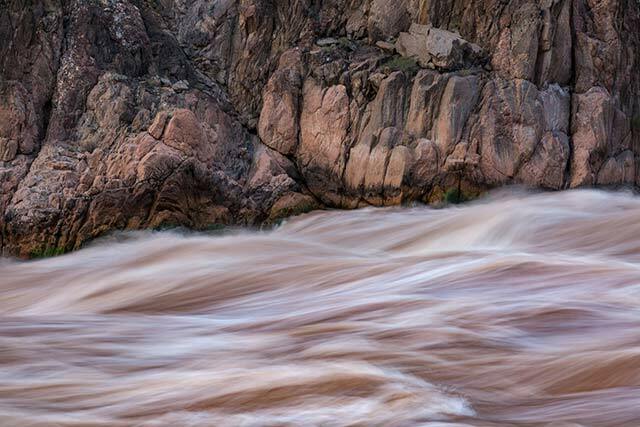 Traveling down the Colorado River on a private whitewater river trip is a rewarding experience, both for the extreme moments of adventure and sensational places to photograph. A recent river trip was especially fun being with several of my buddies that thoroughly enjoy an adrenaline-filled life. Another highlight was the opportunity to realize a long-held dream. I had wanted to row the length of Grand Canyon. So, at 58 years old, I chose to captain an 18-foot raft, rowing day after day, over calm waters and through raging rapids, on a journey of 226 miles down the mighty Colorado River. There’s a first time for everything. It wasn’t t my first river trip, in fact it was my fourth time through the canyon, but this trip was my favorite by far. The river and I started a conversation on Day 1, and I continued to get to know it intimately over an amazing three weeks. For those 21 days, from the launch at Lee’s Ferry to the take-out at Diamond Creek, we made our way down river, spending time hiking up intriguing side canyons with a variety of geologic wonders, made camps along the sandy shoreline, ate hearty meals we prepared in pans and dutch ovens, and slept under a black velvet sky sparkling with a million distant stars. One of our over-night camps was just above Granite Rapid. This is a huge, thundering maelstrom of moving water that is in the top five rapids that river runners fear the most. I walked down to it from camp several times knowing that the next morning I would need to find my way through the chaos and mayhem. Each time I would watch the massive volume of water racing by, powerful waves crashing as if the ocean surf was madly trapped inside this river. On my third, and last walk down to examine this spectacle of endless, churning action, I brought my Canon 5D Mark III camera inside my Lowepro camera daypack, the Photo Sport BP 300 AW II, and my Gitzo carbon fiber tripod. It was nearing the end of the day, and deep inside the canyon the light was fading fast. To make an engaging photo I often accentuate contrasts. Here along the shore of the river I began to appreciate the contrasts between the solid rock cliffs and the boisterous river. Wet and dry. Fluid and static. Dark and light. The movement of streams, rivers, or waterfalls has been a subject that has fascinated me for years. That evening I asked myself: How do I capture the feeling of this raging river in a photograph? The settings I chose were an aperture of f/22 which gave me a slow exposure of 0.5 seconds. I zoomed my Canon 24-105mm lens to the telephoto extreme to compress the perspective. The river is moving in the photo with the force I was experiencing when I stood there. The dramatic contrast of the rushing water with the calm geometry of the primordial stone was now locked in time, and told the story of that place at that time. The photo doesn’t try and tell the story of the entire canyon, just the sensation of standing beside this magnificent giant of a river rapid. The river had many moods for me to get to know and understand. In the end, my courage and curiosity brought us together in a way that fostered my respect for both its dynamic ferocity when it threatened to capsize our boat, and its beautiful stillness, when the soaring cliff walls reflected across it’s placid face. Contrasts. That’s what makes life occasionally intimidating, and constantly interesting. And always, the river flows on.